Cummins 5.9L Early Engine In-Frame Rebuild Kit - 12 Valve. 6 Piston Pins & Retainers. This engine does not use liners. You are looking at a Cummins 5.9 (Early) Engine In-Frame Rebuild Kit in aftermarket parts. The Cummins 5.9 Engine In-Frame Rebuild Kit weights about 70lbs. When we give you estimated time of arrival for your order we are passing the information from our providers to you. 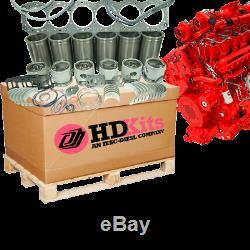 The item "Cummins 5.9L 6BT Engine In-frame Rebuild Kit 12 Valve" is in sale since Tuesday, June 9, 2009. This item is in the category "eBay Motors\Parts & Accessories\Car & Truck Parts\Engines & Components\Other". The seller is "iescdiesel" and is located in Miami, Florida.